What do your Thanksgiving traditions look like? I love everything Thanksgiving! From the menu planning, the turkey roasting, the guests gathering and right through to the final bite of pumpkin pie, it’s my favourite holiday. At my house, we start the day off with an early morning hike in the crisp autumn air to admire the falling leaves followed by a family breakfast with a big pot of coffee. And then the real fun begins! First, I prepare the star of the table: the turkey. 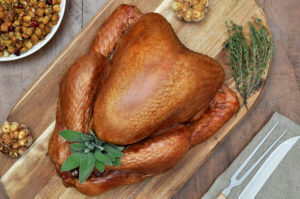 While there are all sorts of cutsof turkey for various size groups (ask your butcher or grocer about options), I roast a large turkey – even for a smaller gathering – because all those leftovers are scrumptious in soup, sandwiches and salads. Plus, there are some dark turkey lovers over here – which just happens to be lean and even more nutrient-rich than white meat – and so a turkey with two big legs is a must! When the aromas of a roasting turkey start to fill the house, it conjures up memories of years of Thanksgiving celebrations gone by – all the way back to my childhood. Turkey truly is the ultimate comfort food. Next up, everyone chips in to help prepare all the scrumptious sides: stuffing, mashed potatoes, sweet potatoes, garlic-y green beans and shaved brussel sprouts. I try to include some make-ahead dishes so that when family and friends arrive, I can make the most of my time with them. Oh, and let’s not forget the gravy! Along with homemade orange cranberry sauce, a steamy pot of rich gravy is the perfect accompaniment for pouring over roasted turkey. Wait? What! A dietitian is talking about pouring gravy? Yes, you read that correctly. As a dietitian, you might expect me to focus on all the good nutrients you’ll be getting from the turkey on your Thanksgiving menu. You might also expect me to tell you how to lighten up your side dishes and add more veggies to your menu. You likely expect me to tell you to skip the gravy. Nope! Don’t get me wrong…turkey is MOST definitely a wholesome, nutrient-rich food, and I don’t mind telling you about that, of course. And it IS important for your health to eat more vegetables. And gravy is clearly NOT an everyday food. BUT…this Thanksgiving, I’m sharing a different message. I’m sharing a message about celebrating traditions and enjoying the pleasures of food because eating well is so much more than nutrients. Eating well is also about sharing a meal with family and friends. It’s about cooking traditional family favourites with your kids, maybe using grandma’s recipes. It’s about cherished, long-lasting traditions. 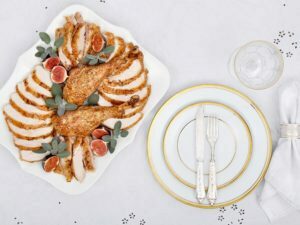 And it’s about creating new family traditions – maybe a barbequed turkey, a quinoa stuffing or a cheese-y cauliflower mash. 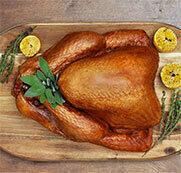 Sitting down to a nourishing meal with turkey and all the fixings is doing more than feeding your body. So, go ahead, pour a little gravy on that tasty roast turkey. Take a spoonful of buttery mashed potatoes. Savour the pumpkin pie. Enjoy all the deliciousness. Whether you’re honouring long-standing traditions or creating new ones, Canadian Turkey has tips, tricks and recipes to help you make a most delicious and memorable meal.